Why in Oregon, Washington, and California (but not Texas or New York) did poorer counties vote for Romney? 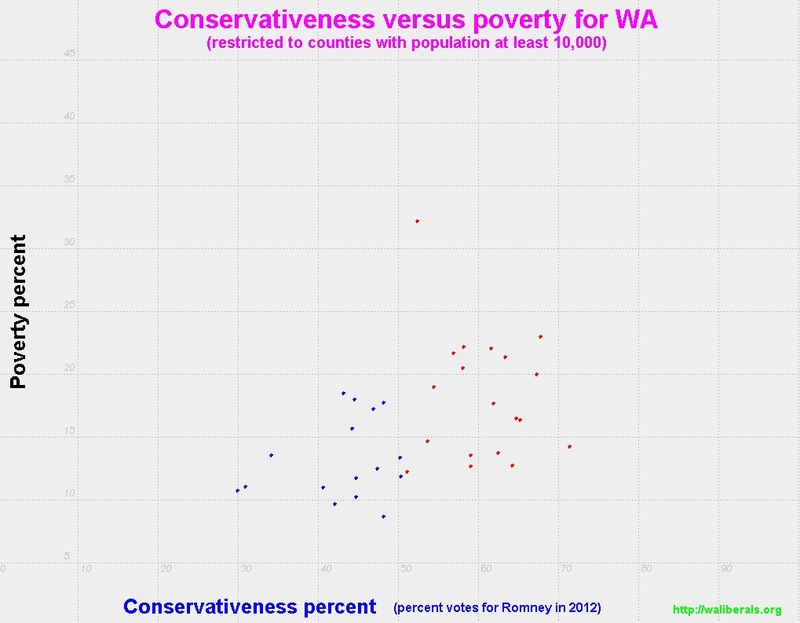 In High poverty counties tend to vote Republican in Washington State, I observed that Washington State counties with a higher percentage of people living below the poverty line tend to vote for Romney. In this article, I extend my analysis to other states. 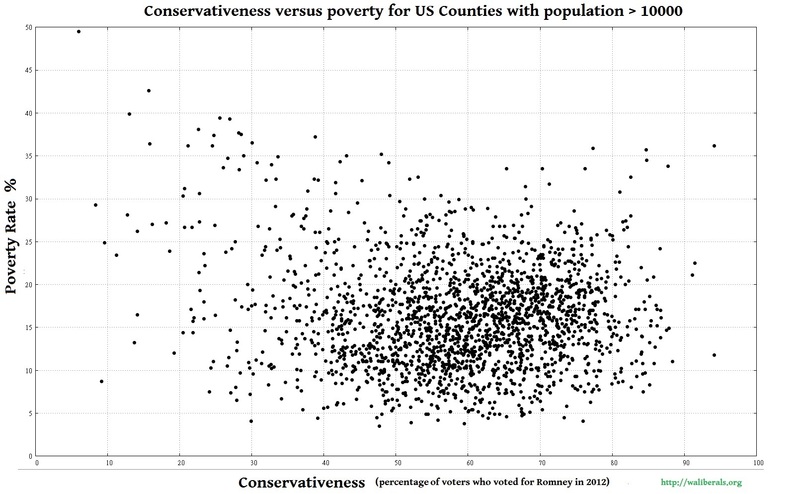 The following scatter graph shows, for counties with population greater than 10,000, how the conservativeness of the county relates to the poverty rate. It shows that in Washington State, high poverty counties tended to vote for Romney. Poverty is defined as the percentage of residents living below the poverty line, according to the 2010 US census. Conservativeness is defined as the proportion of voters who voted for Romney (versus Obama) in 2012. Source of data: US census and 2012 election results from The Guardian. Here's a similar graph for Oregon. It too shows that in Oregon poorer counties tended to vote for Romney. The graph for California is similar: wealthy counties (near Silicon Valley?) 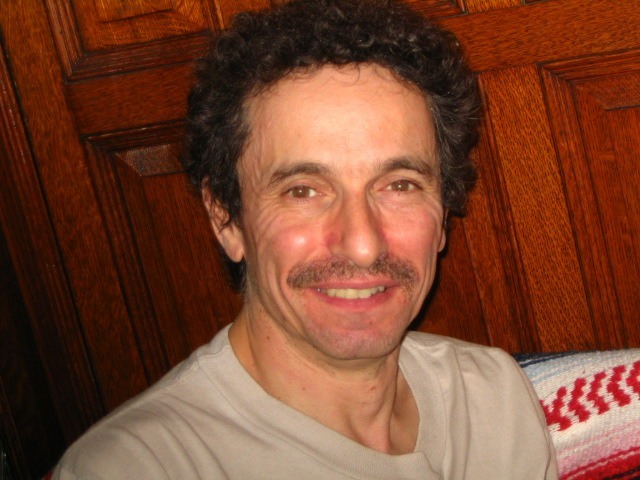 tended to vote for Obama. But there are few or no poorer counties that voted for Romney. For New York too, poorer counties in New York tended to vote for Obama (though the effect is small). Ohio, Illinois, Michigan, and North Carolina are similar to New York and Texas: high poverty counties tended to vote for Obama. In PA Philadelphia stands out as a high poverty city; in Philly 85% of votes went to Obama. 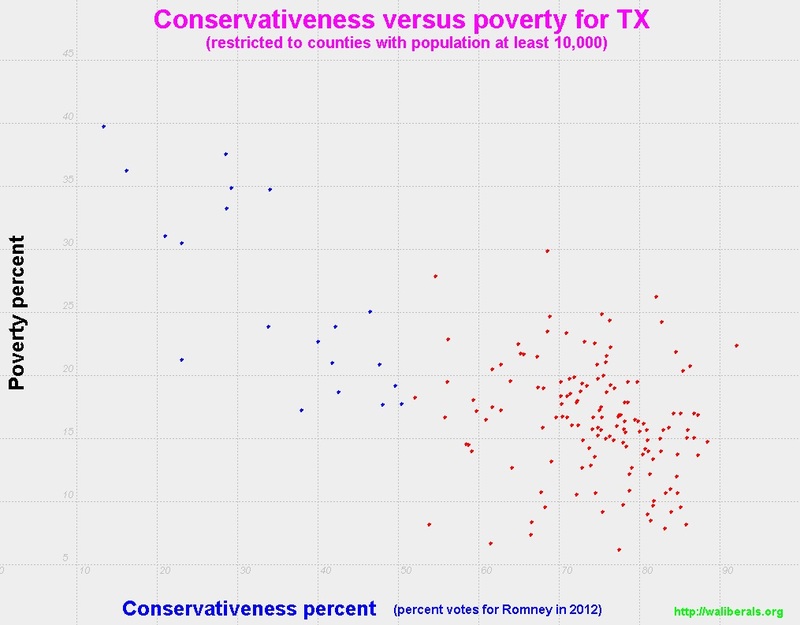 Nationwide, there's a small relation between conservativeness and poverty: there's a cluster of some high-poverty, Obama-voting counties on the upper left of the following scatter plot graph, as well as a smaller cluster of high-poverty, Romney-voting counties on the upper-right. So, my question is: why in Oregon, Washington, and California -- but not in Texas or New York -- do poorer counties tend to vote Republican?